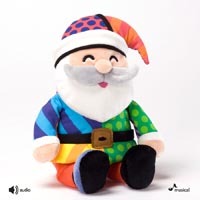 Britto Pop Plush Musical Santa Claus | CowParade New Figurines | One Price Low Flat Shipping! From Enesco Gifts Britto Holiday Collection, Snowman Musical Plush. Made of Plush and Canvasl. Measures10" H x 2.5in W x 8 in L.
This vibrant plush snowman designed by popular pop artist, Britto, plays Let it Snow when you press the snowman's belly. Included is an IC Chip Unchangeable Battery. Surface Washable Material. Great to match up with Britto's Santa Claus Plush!